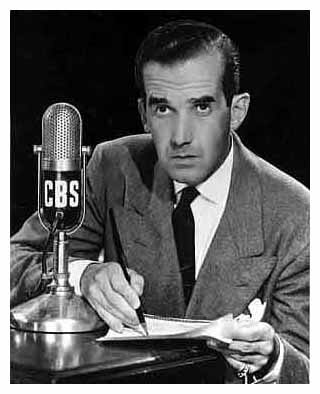 Edward R. Murrow (born Egbert Roscoe Murrow 1908-1965) was an American broadcast journalist. He first came to prominence with a series of radio news broadcasts during World War II, which were followed by millions of listeners in the United States and Canada. Historians consider him among journalism's greatest figures, noting his honesty and integrity in delivering the news. “ I pray you to believe what I have said about Buchenwald. I have reported what I saw and heard, but only part of it. For most of it I have no words. If I've offended you by this rather mild account of Buchenwald, I'm not in the least sorry.